Michael Molitch-Hou for Engineering.com: The T3D uses a specially engineered resin, sensitive to white light, to use the light of a smartphone to 3D print objects. Similar to digital light processing (DLP), layered slices are projected from the phone onto a vat of resin. The print bed is gradually lifted out of the vat with each flash of light until a complete object is revealed. 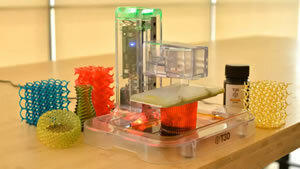 The resin, tuned to the light from a smartphone, makes it possible to 3D print in the open air, though it is recommended that the printer not be exposed to sunlight or strong UV light during the printing process. The Taiwan 3D Tech team began with a curing time of around 5 minutes for 100-µm-layer thickness in 2012 but says that curing time is now about 15 seconds for the same thickness. As a result, the T3D may be about twice as slow as traditional DLP systems, but this is still amazing for turning a smartphone into a 3D printer.